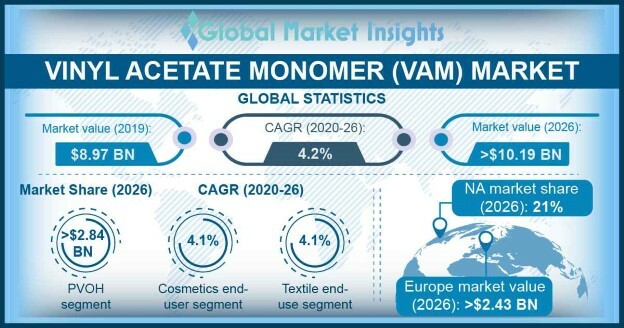 Vinyl Acetate Monomer Market size will likely surpass USD 10 billion by 2024; according to a new research report by Global Market Insights, Inc.
Vinyl acetate is an intermediary used for producing polymers and copolymers which are used in paints, paper coatings, adhesives, etc. It occurs as a clear and colorless liquid. This intermediary composite is majorly used for producing polyvinyl acetate and polyvinyl alcohol. Polyvinyl acetate has improved bonding property which find application in industrial and paper coatings whereas polyvinyl alcohol is significantly used in textiles, photosensitive coatings, packaging, etc. Packaging application is led by increasing consumption of processed food products. Due to shift in eating habitats and rise in numbers of working population globally which is subsequently surging the demand for fast food and packaged food products. Accelerating the need for protective and eco-friendly packaging. Moreover, several fast food restaurants and take away outlets are witnessing substantial growth in recent years which is propelling the need for different varieties of packaging material. Building and infrastructure industry is rising exponentially to established better facilities. Ongoing trend of industrialization and urbanization is stimulating the demand for better roads, railways, ports and water utilities in developing economies. Moreover, growth in retail industry had dictated the requirement for better logistic system, warehousing facilities and stores which is favoring the building and infrastructure industry. Hence, building and infrastructure industry is anticipated to grow over the years which in turn will generate higher returns for vinyl acetate monomer market. Stringent environmental regulation implemented on vinyl acetate monomer like EPA and REACH may hamper market growth over the years. Fluctuation in raw material price like ethylene may hinder market demand. Further market is challenged by hazardous health impact on inhalation of vinyl acetate monomer causing irritation in eye and respiratory tract. Polyvinyl alcohol is synthetic hydrophillic polymer. Its propertise depends on the degree of polymerization such as ratio of two monomers. It has significant application in construction sector as a fiber reinforcement for cement based composite material and aggregate surface pre-treatment agent. The polyvinyl alcohol application demand is growing at a phenomenal pace owing to its application in building and infrastructure industry. Cosmetic application is growing moderately over the years with growing usage of polyvinyl acetate as binder and stabilizer in eye make-up products like mascara and eyliners. Moreover application of vinyl acetate in textile sector is growing remarkably with ongoing fashion trends and consumer inclination toward self grooming & maintaining practices are instrumental in driving the segments over the estimated timeframe. Middle East & Africa is second largest market for vinyl acetate monomer. High demand for vinyl acetate in building and infrastructure industry is compelling serveral manufacturers to increase their production capacity. For instance Sipchem had opened new plant in Jubail, Saudi Arabia to produce ethylene vinyl acetate for meeting the demand of suppliers. Ethylene vinyl acetate have inclusive applications in various end user industries such as textile, construction etc. as it used in manufacturing adhesives, coatings, paints etc. The prominent market players are Exxon Mobil Corporation, Dow Chemical, Ineospec Inc, Celanese Corporation, Sipchem, Wacker Chemie, NINGXIA YINGLITE CHEMICAL, KURARAY CO., LTD., LyondellBasell, Arkema and Sinopec Group among others. Most of the companies in this market are ensuing similar strategies like expanding their production capacity and increasing their products prices to explore greater opportunities and gain competitive advantage.